I developed the concept for the Pegasus around the idea that the majority of people do not know the science of flying in an airplane. Most travelers just hope it all works out correctly without considering what it takes to achieve flight. It is almost as if it is magic. 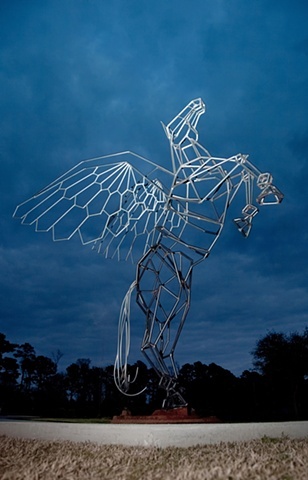 In this way, a Pegasus is a good sculpture to display at an airport, in order to remind passengers of this theme. I also chose the Pegasus because of my interest in horses, and what they represent to me. They are majestic by themselves without the added wings. For me they represent an important time in my life. I will continue to use and elaborate on the Pegasus as a theme in my future work.